Still no sign of DOT's front wheel spindle - seems they want to grind it to final size. The perils of not being able to do the job yourself I'm afraid. Seeing as I was officially suffering from "lack of cafe syndrome" Andy gave me a lift down to Quatford. 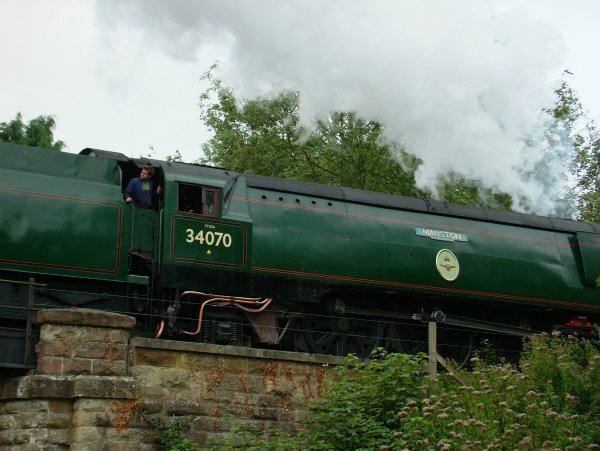 Of course, we had to carry on to the Severn Valley Railway where there seemed more than the usual number of folks parked at the side of the road and waving cameras about. Seems they were running this 'ere Battle of Britain class jobbie - seen here going over the bridge at Hampton Loade. We returned via Belbroughton where the Scarecrow Festival was in full swing - with some of the scarecrows bearing an uncanny resemblance to folks I know.